Internet, TV, and phone outages can be frustrating, so take a deep breath and follow these steps to get back up and running in no time. A network outage is an outage that affects your area, not just your house. To check for one, go to My Equipment in My Account and review the Network Status message. You can also check the home page in the Cox Connect app. See a Red Network Status Alert? Do not reset or reboot your equipment as it may cause additional problems. 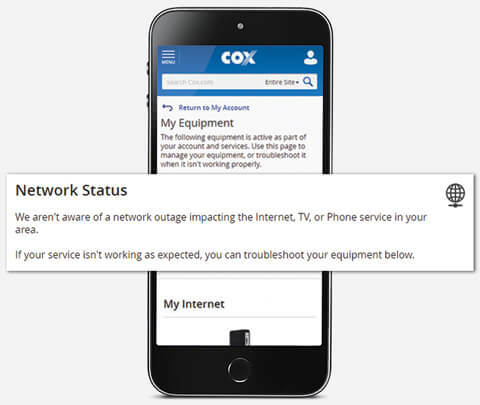 Cox is aware of a network outage and is working hard to restore your service, so there's no need to contact us or troubleshoot further. You can sign up to receive a text message notification once the outage is resolved. Simply submit your mobile number in My Equipment or the Cox Connect mobile app. Check out a few tips below for ways to stay connected during an outage. Enjoy free access to 500,000 WiFi hotspots nationwide with Cox Internet Preferred or higher. Simply find your nearest hotspot on cox.com or the Cox Connect app and sign in with your My Account login. Watch TV live and On Demand with the Contour app—free with a Cox TV subcription. Download the app to your mobile device or go to watchtv.cox.com on your computer and sign in with your My Account login.